The following guest column was submitted by State Rep. Curt Nisly, who represents District 22. 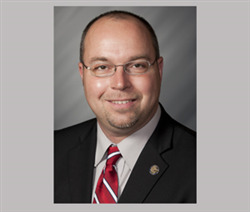 Confined Feeding Operations (CFOs), HB 1494, by Representative Dave Wolkins, passed the House last month. I received input from many throughout the district. The major concern was that CFOs might not need to obtain approval from the state before expanding or constructing a CFO. However, with this bill, CFOs do need to obtain approval from the state, and get a new permit for every time they expand 10 percent beyond the original permit, based on the volume of waste produced. I heard from both sides, and I believe that amendments addressed concerns and made the original bill better. I supported the bill that passed the House, because I believe it will balance the importance of the agricultural industry’s need for clarity of rules and the ability to perform maintenance to operations, with the concerns of citizens who want to make sure our lakes and rivers are protected for tourism and for our use. Lyme Disease Awareness, HB 1061, urged health care providers to provide more information related to Lyme disease. Many people from District 22 came down to Indy to testify about Lyme disease and how they never received a lot of information related to the treatment and care of the disease. I was grateful that my colleagues in the House heard about how Lyme disease has been a burden to many Hoosiers and their families. As a result of this hearing, the state Health Department has made a commitment to generate better information for health providers on this disease. I want to thank those who traveled to Indianapolis to testify for sharing concerns about Lyme disease. Protection at Conception, HB 1134: This year I authored a no-exceptions bill to legally protect the unborn starting at the moment of conception. While HB 1134 did not receive a hearing in committee this year, we have initiated an encouraging discussion about the ethics of abortion. Science is clear that human life begins at conception, and I look forward to seeing Protection at Conception advance into law in the near future. Finally, I want to discuss some financial issues. This is a budget year, and the legislature is required to pass a budget for the next two years. The first topic related to the budget is funding for roads and infrastructure. I am in full agreement with every one of you who believe that it is important to have quality roads throughout the district and throughout the state. If Indiana were to hold the line on other spending for this budget cycle, there is enough anticipated revenue to fund needed maintenance and repairs for roads and bridges, along with some new construction projects. However, the House instead advanced a plan to hike gas taxes enough to give Indiana one of the highest gasoline taxes in the nation. I believe that if Hoosier families should have to reduce items in their budget, so should government and I was opposed to the gas tax hike. I will be calling on my colleagues in the General Assembly to find the money for roads out of our own budget. In the House budget, there are several things in it that I did not like, such as expanding pre-K and other programs. I also am not a fan of a cigarette tax that is included in the budget. However, in remembering my first responsibility is to be your representative, there were aspects of the budget that I liked. For example, the General Assembly was able to keep any increases in spending to a rate that is under the rate of inflation. So that shows that we’re trying to be smart with the taxpayer money. The budget also includes some increased funding for Direct Service Professionals, which help provide care for those who may not be able to care for themselves. This money will be used on the front lines in groups like Cardinal Center and MDC Greenwood. Those agencies provide a useful service to members of our community and I feel that I should support them. Please continue to give me feedback as the House now begins to consider bills the Senate has passed. It helps me greatly when I hear from you about legislation that is important to you. My email is h22@iga.in.gov.